Doing the dishes is my least favorite part about making dinner. As a matter of fact, I detest the hot water, random pieces of food in the drain and knowing I didn’t scrape perfectly. However, the aftermath is something special. 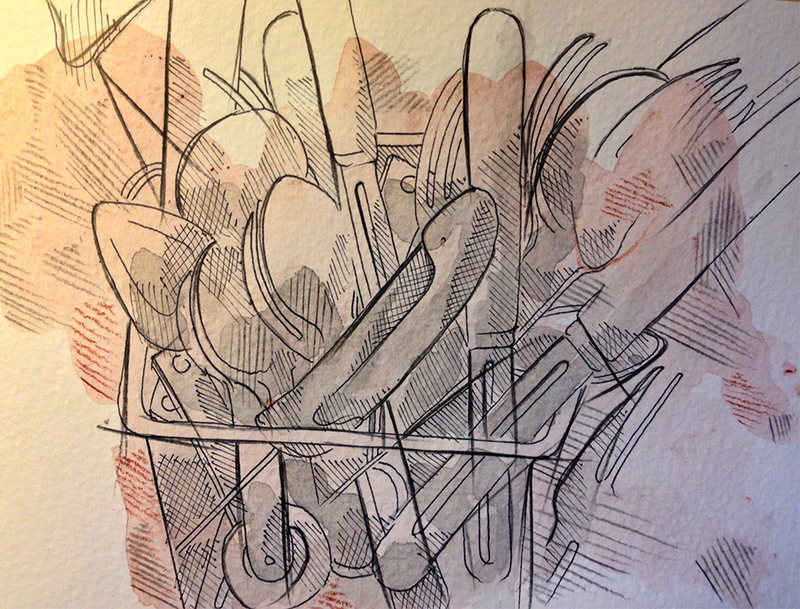 Because after the dishes and the silverware are cleaned, they can be illustrated using line and form. What better way to enjoy dessert. Great line quality; I’m really enjoying this. The splash of color here and there pulls it all together. Is it water color you use or something else? Thank you Rachel! I used a watercolor wash in the background, illustrated, watercolor wash in foreground and then highlighted with a black prismacolor. …wow, barry. you take on artistic challenges I’d rather do dishes instead of attempting. how intriguing. (btw, the answer, I’ve found, to hating to do dishes is rubber gloves. it allows me to get close enough to do the job, but not so yucky close that I want/need to stop. I just love your choices. Original and unexpected subject matter ~ : ) I can relate! And then come the desert dishes. Thank you Leslie. Repeat as often as necessary. I like your lines, Barry. When my dishwasher died, I mourned. This really shows any subject can look beautiful! I love your varying line weights here Barry, you have a lot of control and restraint! I haven worked on restraint a lot. It’s not easy for me to tone it down. Great! Also like the bloggy makeover! Thank you Elena. I was wondering if anyone would comment.